Graham Copson is Technical Manager of roofing accessory manufacturer Klober and a member of the NFRC Slate and Tile Technical Committee. So, what has got so many people worked up about changes to a British Standard, BS 5534 to be precise? Well, it’s because pretty much anyone involved in roofing is affected. The changes affect underlays use of mortar, tile fixing and battens and though there was a transition period during which use of the old Standard was still OK this expired on 1st March. On a positive note, the NFRC has been lobbying members to prepare them for what lies ahead and as one of the roofing industry’s leading manufacturers Klober has been providing free training. These courses are carrying until the end of April at least. There is a lot to take in but in truth it’s pretty straightforward. What hasn’t helped is information put out by some manufacturers which at best is incomplete and will cause confusion for roofers and merchants. The first point to make relates to mortar fixing of ridges, hips and eaves. Mortar has no tensile strength and silo mixed material in particular has been the cause of widespread problems. For some time now, around two thirds of all roofing claims each year under the NHBC Buildmark Warranty have related to mortar fixing and the trend was not improving. You can still use mortar but ridges and hips must also have mechanical support. If dry fixing is not right for a project fixings are widely available to screw ridges through the mortar to a ridge batten. Bear in mind too that the Standard gives plenty of new information on correct material ratios and even the right grades of sand to use. 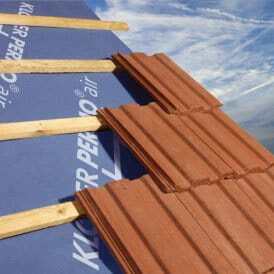 Dry fixing, though is a more reliable option and guarantees a consistent ridge or hip every time. 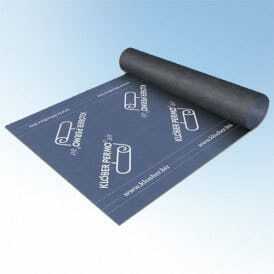 The Standard will also affect manufacturers, particularly in relation to labelling of underlays. 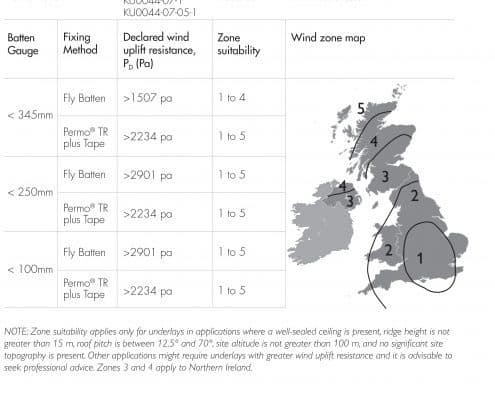 Complaints about lightweight products ‘ballooning’ had led to updated wind uplift information being produced, enabling a wind zone map of the UK to be published in the Standard. 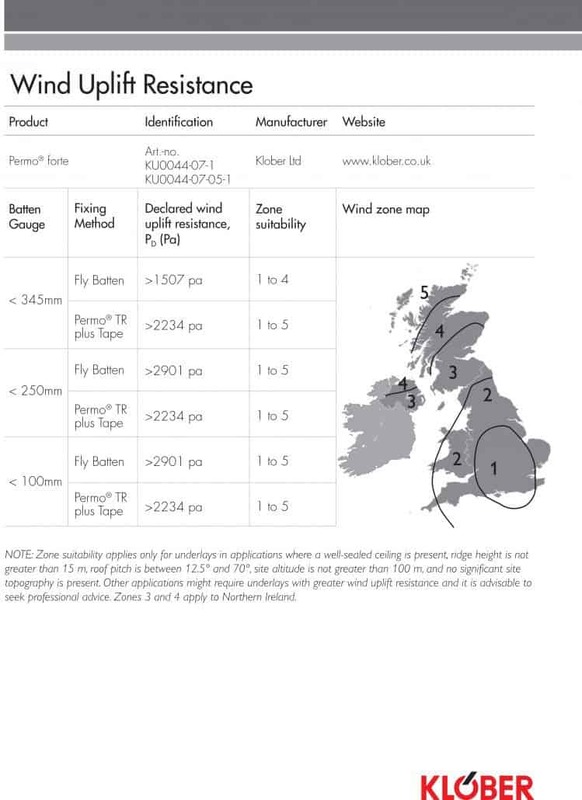 Lightweight products have often been sold as like-Manufacturers must now put information on wrappers which shows the zone limit for a product so this should stop inadequate underlays being sold for projects which they are clearly not suitable for. However beware as some manufacturers are simply Labelling will at last, therefore, provide a measure of comparison for the dozens of products available as, though many have BBA certification this has in many senses been unhelpful as it masked variations in product quality. The new Standard should, therefore, prevent inadequate underlays being sold as ‘equivalent to’ ones which are genuinely fit for purpose. 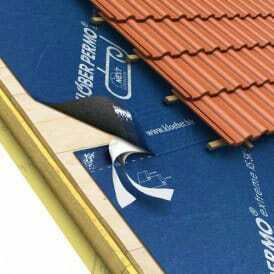 The new test measures an underlay’s resistance to wind uplift, the importance of which has been reflected in situations where underlays have failed to protect the roof structure by reducing the force acting on tiles. Ballooning occurs when an underlay stretches because of wind pressure causing it to come into contact with and ultimately lift tiles. BRE tests have confirmed that an air-open underlay such as Permo® air exceeds the minimum wind uplift resistance of 1600 Pa and can be used at a 345mm batten gauge in all zones (used with Permo TR tape for Zones 4-5 instead of the additional fly batten which is otherwise required). It can be used up to Zone 3, which extends as far north as Aberdeen, without it. Other underlays will have, at the very least, to use a 250mm batten spacing beyond Zone 2 and possibly Zone 1. For contractors and specifiers the situation is pretty straightforward – just check the zonal map to ensure that the product offered by a merchant is suitable and ask the underlay manufacturer for a fixing spec if necessary. Checking the map is important because it has been determined by meteorological factors rather than geographical boundaries. Northern Ireland, for example, is split into two zones, Belfast being in Zone 2 while Londonderry is in Zone 3. In Wales too, even an island as small as Anglesey is split on a similar basis. One element of the Standard which will impact heavily on contractors is the need to fix every single lap interlocking tile with either a nail or clip. Changes in wind load calculations were prompted by knowledge of weather patterns gathered throughout Europe and the move is considered by many to be long overdue. Though there is evidence to show that wind speeds throughout the UK have actually reduced over the past two years it is widely forecast that this will not continue. In terms of securing consistent awareness of the Standard’s implications, 24 roofing product manufacturers have agreed to work alongside the NFRC to provide free of charge training for contractors. Klober is one of six doing so in the Midlands and though three courses are already fully subscribed, more are planned within the six month transition window. They are available to any contractor but free to NFRC members who will also receive a copy of the new Standard. Until 1st February 2015, contractors will be able to request a specification to either the old or new standard so time has been given to provide adequate transition and quote for work based on the new requirements. For any roof not started by 1st February, however, the new requirements will apply without exception. Press release created by Nigel Pittman, Pittman PR & Marketing Ltd.